GO-SHIP brings together scientists with interests in physical oceanography, the carbon cycle, marine biogeochemistry and ecosystems, and other users and collectors of hydrographic data to develop a globally coordinated network of sustained hydrographic sections as part of the global ocean/climate observing system. GO-SHIP is a major contributor to WCRP's Climate Variability and Predictability Experiment (CLIVAR) and International Ocean Carbon Coordination Project. GO-SHIP is part of the Global Climate Observing System / Global Ocean Observing System (GCOS / GOOS). The GO-SHIP Science Committee discussed with input from further experts the close zonal sections A9.5/10/10.5 in the South Atlantic and released a recommendation which is available in the document section, or directly here. Minutes from the 29 January teleconference have been reviewed and are now available here. The table with cruise plans has been updated accordingly and now also comprises the sponsoring agency and responsible SC member. The GO-SHIP Science Committee has published its updated Terms of Reference, which are available here. 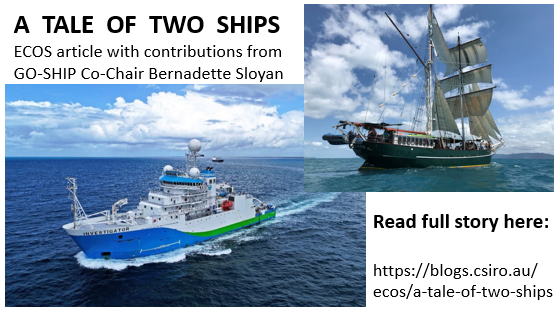 Bernadette Sloyan rotates off this week from a nine-year stint as GO-SHIP Co-Chair; read her latest contribution in a "Tale of two Ships". Thanks Bernadette, on behalf of the GO-SHIP Community, for excellent leadership, and good luck Elaine McDonagh as new co-chair! A Google Scholar Repository is now fully synchronized with the GO-SHIP Zotero Bibliography (see subpage), therewith tracking citations and providing a good indicator for uptake of GO-SHIP data. Please submit any missing publications by e-Mail to coordinator Martin Kramp. The National Oceanography Centre in Southampton, UK, is recruiting a Physical Oceanographer (permanent senior researcher position) to work with new GO-SHIP Co-Chair Elaine McDonagh on aspects of the oceans role in the climate system. The role has a focus on analysis of observations and heat uptake. For details click here. South Africa on associated GO-SHIP line SAMBA. In September, SA Agulhas II occupied the Samba reference line as every year and also deployed a number of autonomous instruments. Caroline Cusack is an Oceanographic Services team leader in the MI Ocean Sciences & Information Services group. She has a Marine Science honours degree and PhD on the diatoms, Pseudo-nitzschia (Peragallo) in Irish waters from the National University of Ireland, Galway, and a diploma in project management from the Institute Project Management, Ireland. She is a member of the ICES WG on Oceanic Hydrography and the ICES WG on Harmful Algal Bloom Dynamics. Part of her work involves organising and participating, often as Chief scientist, in multidisciplinary oceanographic surveys with experience in coastal, shelf and deep sea Atlantic waters. Her main professional interests include understanding the impact of both human pressures (nutrient enrichment, climate change) and natural phenomena (harmful algal blooms) on the state of the marine environment. She has experience working on projects related to biological oceanography, water quality, marine food safety, climate change and ocean observation with a focus on phytoplankton distribution studies, biophysical interactions, satellite remote technology and moored systems. Caroline is an experienced project manager of European and National projects, and a winner of the 2013 EU COPERNICUS (Global Monitoring for Environment and Security) Masters Prize for the best earth-monitoring service for European citizens. JAMSTEC calling for international cooperation on board MIRAI on her (re)visit to IO8N and IO7S in 2019/20. In two legs, from early July to late September, RV Nathaniel B. Palmer has completed a P06 cruise. Numerous floats were also deployed. RV Ryofu Maru has revisited the northern part of P13. A prestigious Scientia PhD scholarship is available on a competitive basis to a high-achieving talented student for the following research project at the University of New South Wales, Sydney, Australia: "Changes in Ocean Ventilation: Deconvolutions of Hydrographies and High-Resolution Modelling", see details here. Ireland has completed the A02 cruise with RV Celtic Explorer; a video is now available here. Euro-Argo & JCOMMOPS (UNESCO-IOC/WMO) are co-organizing a workshop on ocean observing educational activities. The meeting will be held in Oceanopolis Aquarium in Brest, 13-14 June 2017. Registration is open! More Information here. Ireland as one of the "youngest" GO-SHIP members is now on A02 with RV Celtic Explorer, another very good example for international cooperation. News from the cruise are available on this blog. The Japanese RV Mirai has successfully completed section P17(E). The ship had left Punta Arenas on 8 February and arrived in Auckland on 5 March. Lynne Talley, GO-SHIP Executive Group Member and Distinguished Professor at Scripps Institution of Oceanography, is the Prince Albert I Medal recipient 2017: 'For her seminal contributions to our understanding of all ocean basins, including landmark discoveries in the Pacific, Atlantic and Southern Oceans". Congratulations! 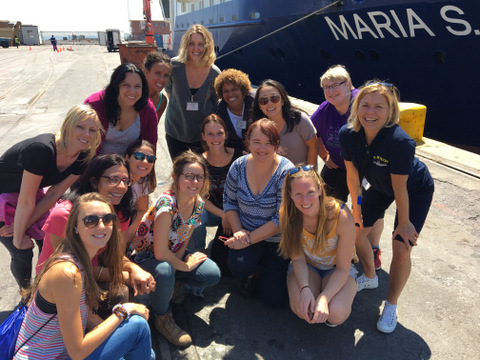 With a scientific party of 15 women and 7 men from 8 different countries, the end of the GO-SHIP cruise on RV Maria S. Merian was a perfect opportunity to celebrate the International Day of Women and Girls in Science. During the cruise have been collected 7 000 km of underway observations over the upper 1 000 m of the ocean, undertaken 129 full-depth hydrographic stations, and unwound 500 km of wire, on a line running from the southern tip of Africa to South America along 34.5 degrees South. The cruise also showed the importance of cooperation across different observing networks: A number of Argo floats have been deployed, and the course of the vessel has even been altered for a few hours to recover a malfunctioning R&D Bio-Argo float for French colleagues. Three global class ship on GO-SHIP missions are meeting today in South America: RV Ronald H. Brown (US) at the end of P18, RV Polarstern (Germany) at the end of A12-SR04, and RV Mirai (Japan) at the beginning of P17. The US GO-SHIP program is looking for students to participate in hydrographic long-line cruises (1-2 months) this coming summer (2017) in the South Pacific, see details here. Maria S. Merian has left Cape Town and follows 34.5 degrees South across the Atlantic on a modified A10 GO-SHIP line, therewith joining boundary Brazil and South African Samba and SAMOC sections, respectively. It is a multinational cruise and presents a good mechanismn to involve more countries in GO-SHIP. The 6th GO-SHIP Committee Teleconference took place today, meeting minutes are available in the documents section or directly here. NOAA ship Ronald R. Brown is currently performing a GO-SHIP cruise on P18. Norway has completed a cruise on section 75N with R/V G. O. Sars. JMA (Japan Meteorological Agency) just completed the P09 cruise with RV Ryofu-Maru after a total of 91 casts. The public review of the new 2016 GCOS Implementation plan "The Global Observing System for Climate: Implementation Needs" is now open. This new implementation plan aims to guide climate observations over the next 10 years, meeting the needs of the UNFCC, adaptation planning, climate services and climate science. Following approval by the GCOS steering committee, a final version will be submitted to the UNFCCC for COP22. Anyone interested in climate observations is invited to comment on this draft by 5 September 2016. The review draft and instructions on how to submit comments can be found here. WCRP and GCOS have established an International Data Prize, awarded annually to honour achievements in (climate) data product generation, data management, data preservation, data monitoring, and other data relevant activities by an early- to mid-career researcher. More details on eligibility, required nomination material and selection process can be found here . Nominations of suitable candidates should be forwarded to the WCRP ([email protected]) and GCOS ([email protected]), and must be received by 1 Oct 2016. The report on the IOCCP-JAMSTEC 2015 Inter-laboratory Calibration Exercise of a Certified Reference Material for Nutrients in Seawater is now available here. Spain, in cooperation with France, is currently on A25(OVIDE). The cruise started from Vigo on 19 June and the work on A25 should be finished by 14 July. JAMSTEC confirmed today a full 99-day shiptime to occupy I07S and I08N with RV Mirai in the 2019-20 season. RV Investigator has successfully sampled P15 S from the ice-edge to 42 S. Leg 2, from 42 S to the equator, will begin next Friday. RV Investigator has just left Hobart for a 7 day transit to the first station. The sea-ice is expanding northwards, but it is hoped that operations can start at 57 degrees South. The third occupation of the GO-SHIP I09N line is underway; most of the used equipment had already been set up for the preceeding IO8S cruise. Follow the cruise here. Members of the GO-SHIP Committee will report on the status of the now ongoing (2012-2023) decadal hydrographic global survey, established through an international collaboration amongst a number of nations and therefore requiring significant coordination to ensure a coherent program. This town hall will provide an update, including (1) the status of and updates to the current plans, (2) data availability and suggestions for improvements to data access, (3) connections and contributions to related large-scale ocean projects and other ocean observing systems, and (4) emerging issues that the global survey should consider. When and where: Thursday, February 25 from 12:45 PM to 01:45 PM at the Ernest N. Morial Convention Center (228-230). The direct link to the OSM program is here. The US currently occupy I08S with RV Roger Revelle. Follow the cruise on its blog or find more information on the cruise website. The Scientific Committee on Oceanic Research (SCOR) is accepting proposals for 2016 SCOR Working Groups from now until 17 April 2016. SCOR will approve new working groups at its annual meeting, this year held in Sopot, Poland on 5-7 September 2016. Please find the 2016 Call for SCOR Working Groups here. The guidelines, a template, and word limits, are available here. Now available here: A major update of the original GLODAP (2004). Data from 724 cruises are included, covering 1972 to 2013. GLODAPv2 includes all data from the original GLODAP, data from CARINA and PACIFICA, and data from 168 new cruises. All data have been evaluated for measurement bias and adjusted appropriately, using a consistent method. The end result is the most comprehensive and rigorously quality controlled ocean interior data product for marine biogeochemistry studies. The GO-SHIP community mourns the sudden and unexpected loss of our friend and colleague, Aida Fernandez Rios, who passed away in December 2015. Aida was an esteemed researcher and a person of great humanity who spearheaded the repeat oceanography efforts in Spain since the early 90-ties. She was a scientific leader and a nourishing mentor to her many students. Her achievements were numerous. She was among the first females to conduct studies in marine sciences in Spain, where she became a pioneer in the research of the role of the oceans in climate change with a focus on the global ocean carbon cycle. She was also the first woman to become director of the Institute for Marine Research, in Vigo, Spain, a premier laboratory of the Spanish National Research Council (CSIC). She published over 90 highly cited peer-reviewed papers. She was highly regarded in the ocean carbon community for her expertise insights, tenacity and contagious cheerful personality. She was well known for her strong interest in collaboration and international outreach to push science forward and get things done. Her contributions to the GO-SHIP program were numerous. Of particular note, was her dedication to maintain quality measurements and outstanding interpretations of the frequently repeated OVIDE and FICARAM lines in the North Atlantic. Her research elucidated the complex interplay of transport, biology, and invasion of CO2 from the atmosphere on ocean acidification and carbon cycling in this basin. The GO-SHIP community will maintain her legacy and honor her memory. Many colleagues already contributed to her in memoriam page. In a joint initiative between the Marine Institute and National University of Ireland, and with additional support from the international GO-SHIP community, Ireland is planning to occupy A02 in 2017. Now available here: Changes in Ocean Heat, Carbon Content, and Ventilation: A Review of the First Decade of GO-SHIP Global Repeat Hydrography. The final version of the GO-SHIP 5 meeting minutes is now available in the documents section, or directly here. The GO-SHIP 5 meeting report will be published shortly. In the meantime, the updated data requirements are already available here. Masao Fukasawa (Japan), Takeshi Kawano (Japan), Mauricio Mata (Brazil) and Richard Feely (USA) rotated off the GO-SHIP Committee: Many thanks for all the support they provided. Additional new Committee members are Katsuro Katsumata (Japan), Jae Hak LEE (Korea), Emil Jeansson (Norway), Anil Kumar (India), Eleanor O'Rourke (Ireland) and Edmo Campos (Brazil). The complete Committee is here. New countries, new committee members, and new GO-SHIP categories are the most important results of the 5th meeting of the general GO-SHIP Committee, and GAIC week. Prior to GAIC, a GO-SHIP committee meeting will take place in Galway on 14 September at, and kindly supported by, the Marine Institute. 11 September at 12:00 p.m. Global Mean Time (GMT), GOOS Webinar by GO-SHIP Co-Chair Bernadette Sloyan (CSIRO): Update on the GO-SHIP network, plans and recent scientific results. The GOOS Webinar Series is a monthly opportunity to hear about activities and topics of interest to the GOOS community and to interact with the speaker. The reviewed meeting minutes of the last Executive Group meeting (9 April) are now available here. With a few days of delay, RV Ron Brown is now on the second leg of P16N. The sea is as calm as can be on what is called the "North Pacific strom track"
Canada has established a GO-SHIP cruise in the Davis Strait, and Norway on AR7. A UK cruise is underway. GO-SHIP co-chairs and coordinator contributed to the JCOMM Ship Observations Team (SOT) and Observations Coordination Group (OCG) meetings in Cape Town, South Africa. The GO-SHIP Executive Group held a video conference today, meeting minutes will be available shortly in the documents section. The new JCOMMOPS office, which also hosts the GO-SHIP coordinator, opended its doors today on the campus of Ifremer in Brest, France. RV Polarstern sucessfully measured the A12 line, but could not complete the cruise in the Weddel Sea after technical issues with the ship. The UK has occupied the GO-SHIP line in the Drake Passage this month, a few weeks later than planned and with reduced parameters. "Sustained ocean observing for the next decade". A combined GO-SHIP/Argo/IOCCP conference on physical and biogeochemical measurements of the water column. 14-18 September 2015, Galway, Ireland. More information on the event website. The reviewed meeting minutes of the last Executive Group meeting (23 September) are now available here. Australia has just confirmed that the new RV Investigator will occupy P15S in 2015, the cruise status has progressed to 'funded'. A French cruise will occupy in July/August 2015 with RV Atalante a part of the P13 line (from 10S to 2N, along 165, every 1/3 degree) but would need support from another cruise and group to gain GO-SHIP status. Contact the GO-SHIP coordinator for more details. The GO-SHIP Executive Group has agreed to add the Extended Ellett Line to the GO-SHIP network. The reviewed version of the GO-SHIP 4 meeting minutes (2014 Ocean Sciences Meeting in Hawaii) is now available here. The new joint US CLIVAR/OCB publication "The US Repeat Hydrography CO2/Tracer Program (GO-SHIP): Accomplishments from the first decadal survey" is now available here. The US fund a national US-GO-SHIP proposal and will occupy with NOAA and UNOLS vessels P16, Arctic Geotraces (ARC01), P18, I08S, I09N, I01E, P06, I05, A13.5, I06S and S4P between 2015 and 2020. Canada and the UK occupied AR07 last month. P16 S was completed by the US last month: 90 stations in 46 days on Nathaniel B. Palmer between Hobart and Papeete. Japan confirmed a reoccupation of I10 in the summer of 2015 with RV Mirai. A GO-SHIP Executive Group and Committee video conference took place on 15 May, the reviewed minutes are available here. The final version of the GO-SHIP position paper on the International Indian Ocean Expedition (IIOE)-2 is now available here. The GO-SHIP Committee and Executive Group met in Honolulu before the opening of the 2014 Ocean Sciences Meeting to take important decisions for the future of the program. In particular the design of the network, core parameters and coordination of contributions and capacities by country have been discussed. More information are available on the meeting website. We would like to invite all interested colleagues to a GO-SHIP / IOCCP Town Hall meeting during the Ocean Sciences Meeting in Honolulu on Wednesday 26 February 2014 at 12:45 in room 313B: Invitation (pdf). New status maps in different formats and projections will soon be available. First draft maps are already on the Reference Sections page. The GO-SHIP bibliography has been transformed into a Zotero Group Library. GO-SHIP organizes a Town Hall meeting during the 2014 Ocean Sciences Meeting in Honolulu: 26 February, 12:45 to 01:45. The main part of the information we gathered in August and September on upcoming cruises has been compiled and validated. The updated bibliography is now available. Many thanks for all the feedback we received. We will transfer the bibliography gradually to a Zotero Group Library. GO-SHIP Coordinator Martin Kramp reported at JCOMM's 29th DBCP session at IOC HQ in Paris on the potential to deepen the cooperation between the programs. GO-SHIP committee and community meetings are planned in February 2014 in Hawaii, prior to the Ocean Sciences meeting. Further information will be provided here as soon as possible. Bernadette Sloyan, Martin Kramp (on the left) and Mathieu Belbeoch met at JCOMMOPS HQ in Toulouse (France). Metadata on upcoming cruises and a GO-SHIP bibliography were main topics. Corresponding changes were realized in the structure of the website. A new Email list has been set up. If you were subscribed to the old list and your mail address recently changed, please subscribe again. GO-SHIP Co-Chairs Bernadette Sloyan and Christopher Sabine met with the new GO-SHIP Coordinator Martin Kramp in Seattle (USA) and Victoria (Canada) to define a work plan.